Is it possible to use a laptop as a secondary display for another computer in Linux Mint? Thanks everyone for trying to help me solve this problem and sorry I didn't fight it 'til the end. I meant just the Cinnamon services, not every command that can be entered in the terminal. How or where can we find a list of all the names of Cinnamon services that can be used in the terminal ? I moved my argumentation to How about Discourse? as the title is more appropriate and focused on Discourse. But this proves we're not as few as some were thinking. I removed the username and password. I contacted them and they told me they don't do tech support for 4G USB dongles. I guess few enough people use this kind of device for it to be poorly supported. So I'm stuck here. Any help is still welcome. Should I put something in Network ID ? 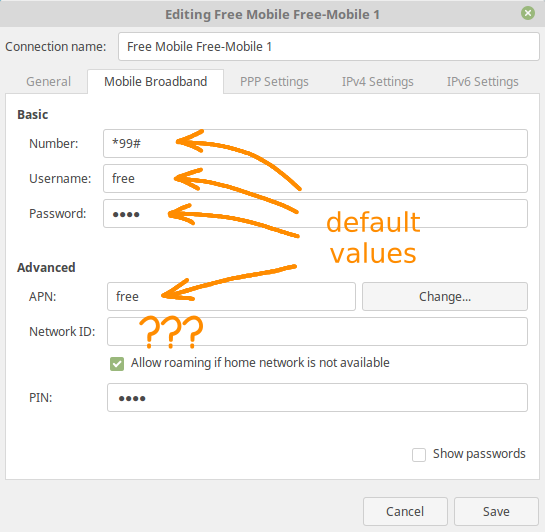 Should I change some default values ? but it prompts me to enter one, so what can I do ? I tried pressing enter without typing anything and the popup comes back.